Heart-shaped balloons installed inside the campus made perfect background for photo-ops for students and school personnel on Valentines Day. Naga City – Valentine’s night at Mariners Polytechnic Colleges (MPC), this city has transformed the campus into an instant enchanted empire whose ambience jived with what February, the ‘month of love’ calls for. 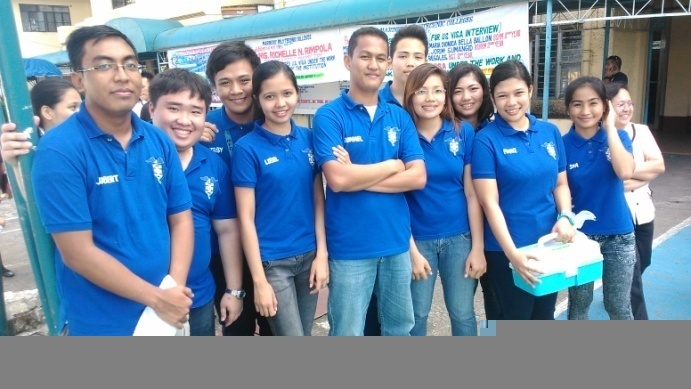 Sponsored by the Supreme Student Council (SSC), the affair was attended by 400 students, faculty and staff. The attendees, more especially the students had a grand time enjoying the evening of music, dancing and singing as they allowed time to pass-by celebrating Valentine’s Day. “It was an affair to remember because ordinarily, people you see and meet inside the school campus during class days are all busy with minds pre-occupied with scholastic issues. On that evening, everyone was dressed for the occasion and the festive mood offered a relaxing atmosphere so everyone took the chance to enjoy and be recharged before they get back for academic work”, declared President Esperanza Francisco, President of the Supreme Student Council. Not only the students took pleasure in celebrating the occasion but the school personnel, as well. With their Valentine’s Day attire, some students and personnel could not be easily recognized that they are the same guys you meet everyday in the school campus. 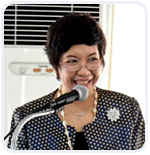 “Some members of the Faculty and Staff had a grand time, too, as it was a time for bonding with fellow personnel in the institution in which they need not have to talk about work but just listen to music, dance, sing, relax and be part of the program”, said Librarian Aileen Domanico. A streamer inside MPC-Naga campus reveals it all. Students, members of the faculty and staff came to share part of themselves in the bloodletting activity, giving them a momentous Valentine’s Day celebration. 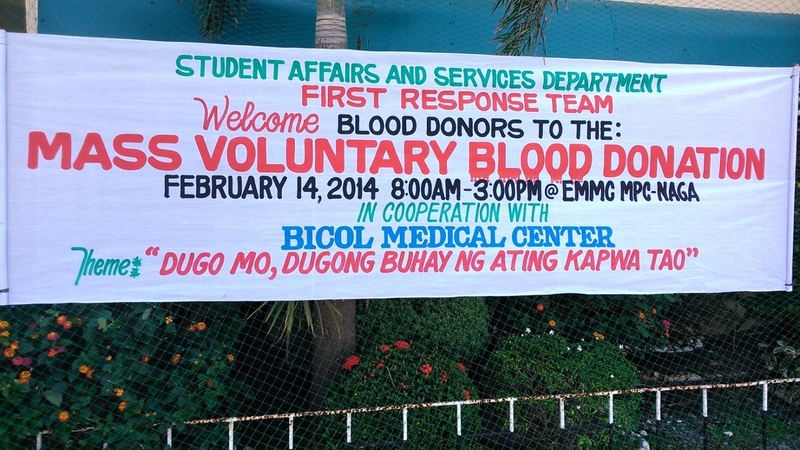 Naga City - The First Response Team of the Student Affairs and Services Department of Mariners Polytechnic Colleges (MPC) this city has initiated the project ‘Dugo Mo, Dugong Buhay ng Kapwa Tao’, a mass voluntary blood donation activity which coincided with the February 14, 2014 celebration of Valentine’s Day. The venture that started from eight in the morning up to three o’clock in the afternoon, was conducted in cooperation with the Bicol Medical Center (BMC) in Naga City. For the donors, this makes a difference for them inasmuch as it is a departure from the usual flower and chocolate-giving by students to their mentors, a boyfriend to his girlfriend or the husband to a wife on Valentine’s Day. “The gesture of giving one’s blood reaches a higher level of humanitarian act which involves the saving of the life of a would-be recipient who might not even be known to the donor. This has become an offering which makes our Valentine’s Day meaningful”, says MPC-Naga Supreme Student Government President Esperanza Francisco. 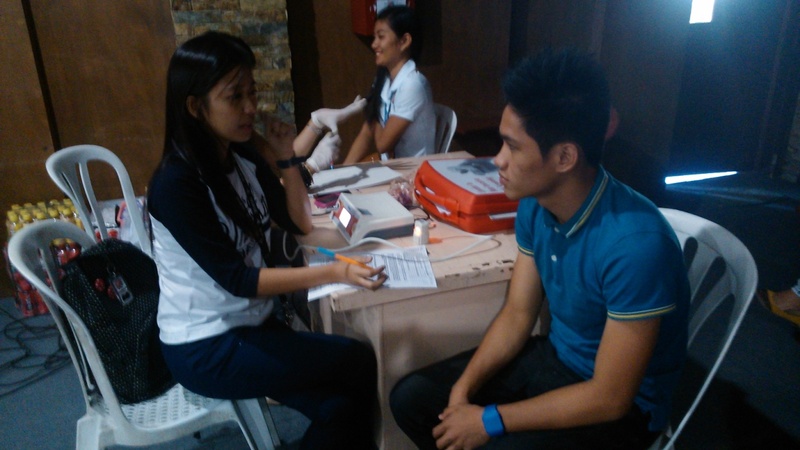 A lady medical practitioner (seated – left side) from the Bicol Medical Center interviews a male student to find out whether he is qualified to donate blood for the project. Another nurse (at the background - partly hidden) explains to a coed why blood donors are needed and the life-saving role it performs in hospitals especially in emergency cases in which blood transfusion is needed. 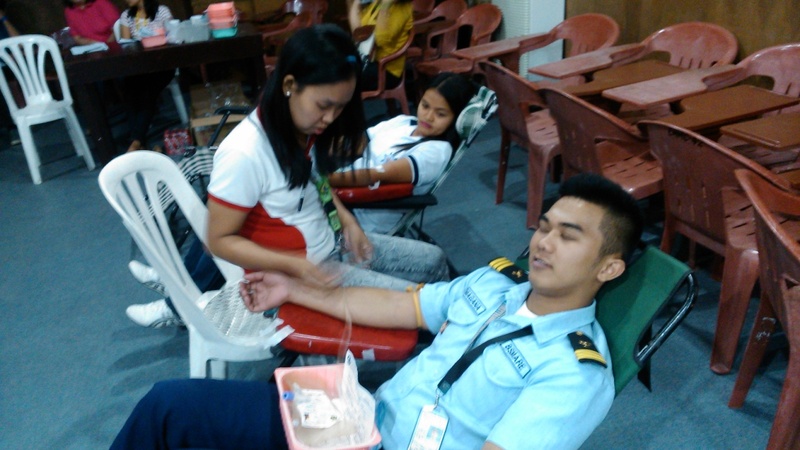 Nurse Rosita Borras (left) as she extracts blood from a donor-maritime cadet. She confirms that it is healthful for a person to give blood from time-to-time in projects like this. Meantime, a personnel from the Bicol Medical Center has confirmed that it is healthful for qualified individuals to donate blood. “Once blood is extracted from the donor, it triggers the human body to produce new blood cells and in a way, a new replacement comes in to revitalize the giver” declared Nurse Rosita Borras, a member of the team that facilitated the project at the MPC campus. It is a fact that the availability of blood is known to have saved the lives of patients especially victims of accidents brought to hospitals for emergency treatment. This makes the contributor a hero in his own right in which his generous gesture to give part of his body has become an instrument in extending the lives of others. “Other advantages which a donor gets is the standard operating procedure done in projects like this that include the blood-typing process, the monitoring of blood pressure and weight of the giver. These are essential matters in determining the health condition of a person”, Nurse Borras added. 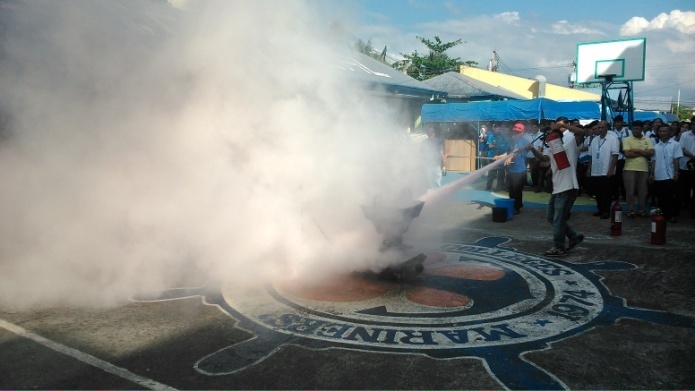 Actual fire-fighting technics being demonstrated before the members of the Mariners-Naga community in simulations conducted inside the school campus by officers of the Bureau of Fire Protection. Naga City – The Students, members of the faculty and staff of Mariners Polytechnic Colleges (MPC), this city scampered from inside the classrooms and offices to the open spaces outside the buildings in the school campus as the fire alarm sounded marking the start of the drill in a simulated fire situation initiated by the Bureau of Fire Protection (BFD) in the city. The activity conducted in the afternoon of February 3, 2014 was made in an effort to familiarize the Mariners-Naga group on what to do and how to react in the event a similar true-to-life situation would occur. Fire Drill participants listen to the lecture conducted during the simulated conflagration and fire-fighting demonstration. 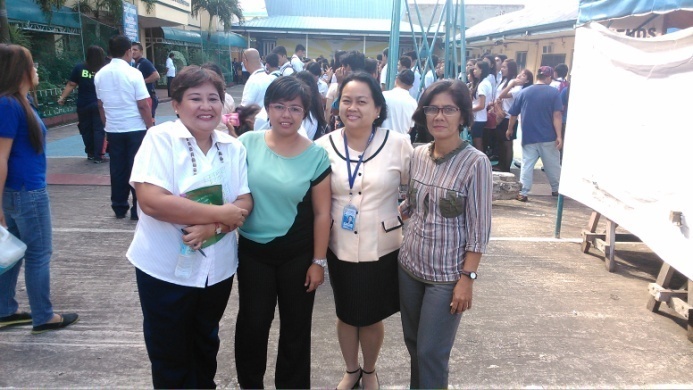 Left picture - Fire Drill participants take a pause from the activity, (left to right) Academic Dean Dr. Luz Martirez, ORES Researcher Gladys Belmin, AB MassCom Chair Dr. Mariel Estrella and a member of the faculty. Right picture – More action at the simulated drill with an on-going fire-extinguishing act being done by a student under the close supervision of BFP personnel. In the mini-lecture conducted by Fire Officer 3 Mario B. Reburiano, Jr., Chief of the agency’s Fire Safety Education/Special Rescue Unit, he told the audience to have a mindset in which everyone is prepared at all times for any eventuality that could happen unexpectedly especially on how to face a situation in which a fire has occurred inside the school campus. An exhibition followed on the use of fire extinguishers in which school officials and students had hands-on experience on their use in putting-out the fire. The importance of reporting the incident to the nearest BFD office was given stress by the authorities as the first few minutes of a fire incident could mean a lot in saving properties and lives of people. Drill participants happily and productively observe the on-going fire-fighting demonstration as they learn new and practical skills. 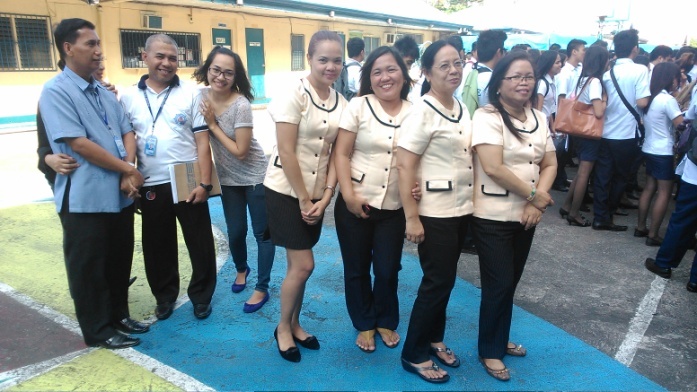 (left picture) Faculty members and (right picture) students of MPC-Naga. FO3 Mario Reburiano was assisted by FO1 Vincent Albert G. Garchitorena, Assistant Chief of EMS/Special Rescue Unit and Firefighter FO1 Ivy C. Belleza.